Click the button below to add the SRAM Red eTap Triathlon Mini Group to your wish list. Electronic shifting is perfect for triathlon and time trial bikes. Mechanical cable routing can not only be hard to thread, but the convoluted route can make shifting sluggish. But wired electronic systems are equally hard to thread, and hiding a battery can be difficult thanks to narrow tube dimensions. SRAM’s Red eTap Aero group brings the smooth action of electronic shifting along with the convenience of wireless, and the flexibility to place shifters wherever you want along with whatever brake levers you want. 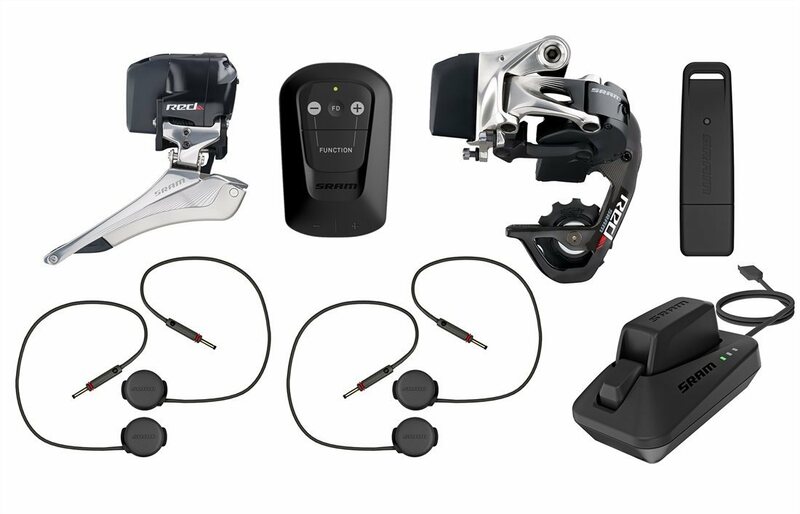 Included with this kit are the SRAM wireless eTap front derailleur, rear derailleur, batteries, four Blip shifters, a master Blip Box, charger, cord, USB stick, and Quick Start guide. In other words, everything but crank, cassette, chain, or brakes. If you’ve got a double-ring crank, an eleven-speed cassette and chain, you can simply add this group to what you have and you’re ready to rock. SRAM designed their eTap system to be different than any other shifting system around. Their goal was not to replicate cable-shifting with electronics, but improve shifting so it’s easier, more intuitive, faster. The left shifters move the derailleur inboard, toward larger cogs (and smaller gears), while the right moves the derailleur outboard, toward smaller cogs (and larger gears). Hold any shift paddle, and it will keep shifting until it reaches the end of the cogs. Hold left and right shift buttons simultaneously and it will shift the front derailleur. If it’s already on the big ring, it will shift into the small. If it’s in the small, it will shift to the big. And the Blip Box, essentially the master controller, can also shift, just use the + and – buttons. The shift design is great, but they also wanted to make installation and adjustment easier. So they made the system wireless. There’s a 2032 coil cell battery in the Blip Box, and removable, interchangeable battery packs on each derailleur. The Blip Box battery should last about a year, while the derailleur batteries about 1,000km-and you can swap the front with the rear if the rear dies on the road. Rather than using a common wireless protocol, which might induce interference, they developed their own. Dubbed AIREA, it’s unique to SRAM. It is small, uses little energy, can reach 100 meters, allows for only one set of shifters or a single Blip Box to be paired with one set of derailleurs at a time. They tested it for five years before releasing it: the system is solid. And to improve functionality, the rear derailleur also broadcasts an ANT+ signal, which some head units can read and then tell you both what gear you’re in and how much battery life you have left. The Blips are amazing for flexibility. The kit comes with four of them, each has a 650mm long wire attached. They weigh 9g each. You position these anywhere you want. You can put them under the tape, in between tape wraps, or just on naked bars. They come with double-sided tape for you to set them in place. Two will push the derailleur left, two right. You can place the up- button next to a down button, you can place them under the bars, on the end cap in front of bars, on top of bars, on a brake lever, wherever. The wires plug into the Blip Box, a command module that sends the shift signals to the derailleurs. It is 40.6mm wide by 61.5mm long by 18mm thick. It has a quarter-turn mount on the back, just like a Garmin computer. The kit comes with two mounts and double-stick tape so you can both have a permanent place for the box and remove it. It can also be affixed to any Garmin-compatible computer mount. The rear derailleur, 239g, mounts to any rear derailleur mount and is designed to work with eleven-speed cassettes with a small cog of 11-teeth, and a large cog as big as 28-teeth. The front derailleur comes as a braze-on-style mount, works with double-ring cranks with a minimum of 34-teeth on the small ring and 55-teeth on the big ring. If you already have any of SRAM’s 22-speed road systems, you just pull your double-tap levers, derailleur cables, and derailleurs, and install these bits. If you’re starting from scratch, you’ll need a crankset, 11-speed chain, and 11-speed cassette. SRAM strongly recommends staying within the SRAM family for optimal performance. Thanks to the simplicity of the components, lever and derailleur setup should take about fifteen minutes. No cables to cut or stretch, wires to thread, nothing goes inside the frame. In addition to the shifting components, the kit comes with the charger and USB cord. Plug it into any USB-enabled plug or your computer. Charging should be about 45 minutes. Batteries come with a 60% charge and should be fully charged before installing. Also included are instructions and a USB stick. The latter is for when it’s necessary to upgrade firmware: plug it in your computer and your computer can communicate with the system. The SRAM Red eTap Aero Group changes the shift paradigm.